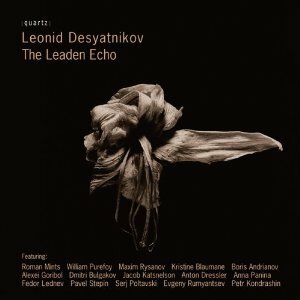 Leonid Desyatnikov is a Russian composer who is very difficult to categorise. In fact, even calling him Russian is to oversimplify, as his was born in Ukraine, although he is now a big wheel in Moscow. As with almost every Russian composer since the 80s, you can attach a series of "post-"s to his work: post-tonal, post-Romantic, post-minimalist...If all this sounds like it is going to add up to post-modernism, that's fair enough, but Desyatnikov's post-modernism is so subtle and so idiosyncratic that it seems to fall well outside the commonly accepted boundaries. Relationships with the music of the past – Haydn, Saint-Saens, Schubert – are the basis of many works on this disc, but in most cases, you'd have to read that in the liner to know. Unlike Schnittke, the most obvious Russian predecessor in this respect, Desyatnikov cultivates healthy and close relationships with his historical models. So there is none of that anxiety of influence that you find played out in Schnittke, most often through the collision of musical styles. Instead, Desyatnikov reinvents his personal voice for each piece, bringing in stylistic elements of the earlier work, reinventing it for modern ears. That could sound presumptuous, and I suspect that many of Desyatnikov's listeners are unlikely to appreciate having their musical tastes anticipated in this way. Even so, his music works. A combination of astute cultural cosmopolitanism and sheer quality of compositional technique allows him to get away with his various indulgences. His music is largely tonal, or at least consonant, yet there is something eerie that is difficult to pin down. Like many of his Russian predecessors, Desyatnikov has worked extensively in the cinema, and visual editing techniques have clearly been influential in the way he structures his work. Jump cuts between one relatively static minimalist texture and another happen in a way that you would never find in Glass or Reich, pulling the listener out of the comfortable situation they have just been in and dropping them in a different environment entirely. Each of the works on the disc is scored for a different ensemble. Return is for winds and strings, acting as a sort of imitation of a Japanese Gagaku orchestra. In fact, the work is all about the issue of imitation. Desyatnikov takes a recording of traditional Japanese music, arranges it in the most culturally insensitive way possible for Western instruments in Western temperament, then juxtaposes this sanitised version against the original by playing the original version on a tape at the end. Du cote de chez Swan has nothing obvious to do with Proust. Instead it is an arrangement of Saint-Saen's The Swan for two pianos in an aggressive minimalist style. Why? It's hard to say really. The composer say that it is, amongst other things, a homage to the Ligeti's Three Pieces for Two Pianos, and there are shades of that great work, but most of it is closer to American minimalist models. Variations on the Obtaining of a Dwelling and Wie der Alte Leiermann...are solo works with piano accompaniment for cello and violin respectively. The first is based on Haydn and the second on Schubert, but I'm only reading that out of the liner, I wouldn't have worked it out for myself. The violinist is Roman Mints, a Russian who has been doing a great deal in recent years to promote the works of his compatriot composers. This album, I suspect, is his project, and he certainly puts in a convincing performance here. "Leaden" is a very appropriate word to appear in the title of The Leaden Echo. This Gerard Manley Hopkins setting is long, dour and repetitive. There is nothing wrong with a composer taking his work seriously, of course, nor of setting downbeat words in a downbeat style, but it does take some perseverance on the part of the listener to get to the end. The last track, the theme tune from Moscow Nights, gives us a taste of Desyatnikov's work for the big screen, which is competent, atmospheric and melodic, but not half as clever as the concert works that precede it. The performances and sound quality are good. A little more definition in the piano sound might have been nice in Du cote de chez Swan, and pedantic Anglophone listeners would probably appreciate more clarity in the diction of Manley Hopkins' words in The Leaden Echo, although it is difficult to tell if the sound production or the singer are to blame there. Otherwise, this is an excellent introduction to the work of one of Russia's most important living composers. It is beguiling and curiously disturbing music, despite its almost uniformly civilised surface. The music stays with you in an unsettling way, and even after repeated listenings it is impossible to tell why.